A couple of years ago I was commissioned to do a large public sculpture for a new shopping centre in Cardiff. 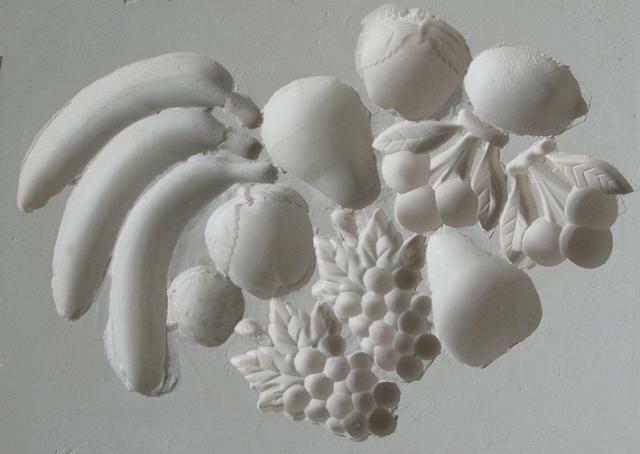 I created four huge plaster friezes which were installed at high level in a circular atrium. As part of the commissioning process I had to present ideas for the sculpture and I did this by casting various motifs and then making Photoshop mock-ups. Coming across these initial designs after quite some time I realize there are ideas here I'd like to incorporate into my Architectiral Friezes Collection. The motifs I used related to large 19th century sculptural friezes at Cardiff City Hall - there are images of these at the end of the post. To make the motifs I cast directly from real life objects, getting an indented, reverse image. Your eyes play tricks and it's sometimes hard to read the image the right way round so I've shown angle shots of the casts. Cast from plastic fridge magnet fruit! Some of the 19th century sculptures from which I took the imagery. 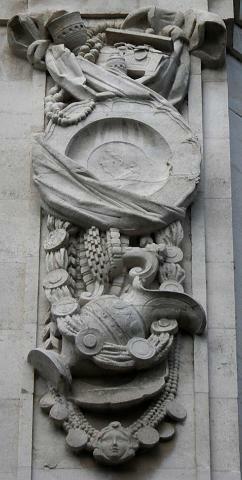 The final sculpture was more complex than these initial friezes and contained lots more imagery. I continued to cast from real life objects but had to use a special mould-making material to enlarge these to the correct scale. Really enjoying this work! the gloves on the book is my favourite piece..